Best Seller... Small 8-digit desktop calculator with angled LCD display. Easy to read and operate keyboard and display with a metal cover with plastic keys. Memory, percent and square root functions and On/Off power feature. Best Seller. Value 12-digit large desktop calculator. Easy to read and operate keyboard and large screen and titled display. Features a metal cover with plastic keys. On/Off power feature, Memory function, Profit and GT summation keys. Fantastic value 12-digit extra large desktop calculator. Easy to read and operate keyboard and large screen and titled display. Features a metal cover with plastic keys. Decimal point selection, rounding switch, back space key, sign change key, automatic constant function, grand total memory function. 8-digit with extra large, angled LCD display. Stylish, modern design with large rounded keys. Memory, percent and square root functions and automatic constant feature. Tax & Business Calculator with 10-digit wide upright angled LCD display with full sized keys. Desktop display calculator with rubber non-slip pads. Easy to use Tax/GST function. Business function to easily calculate cost and sell prices and gross profit margins. Basic 10-digit mid size desktop calculator. Fixed angled display. Extra large display and large keys. Memory, backspace and sign change functions. Tax & Business Calculator with 12-digit adjustable tilt LCD display and full sized keys. Functions include memory, percentage and mark-up/down. Sleek Tax & Business 12-digit desktop calculator with full sized keys for easy operation. Adjustable tilt easy-to-read LCD display with three steps 'click' feeling for easy viewing. Tax/GST function. Business function calculates cost, sell and margin. Includes decimal point slide, rounding switch, memory, square root, % and GT functions. 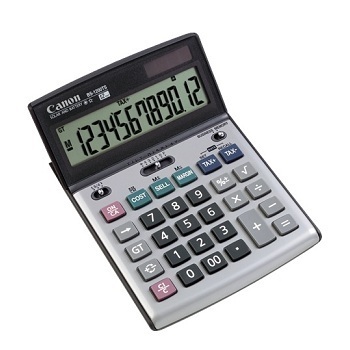 Executive calculator with extra large 12-digit adjustable tilt LCD display. Stylish finish with extra wide spacious "IT-touch" (computer) keyboard and large keys for accurate entry. Tax/GST function. Mark-up (gross profit) function. Large 12-digit LCD display that is angled upright to reduce glare and reflection. Stable stroke “IT-touch” keyboard for fast, steady operation. Tax/GST function. Business function - easily calculates Cost - Sell - Margin. 12-digit Business Desktop Calculator with large non-glare LCD display. Replay function to record, replay and correct calculations up to 100 steps and adjust total accordingly. Tax/GST function. Business function which calculates cost, sell, and margin. Memory, percent and square root functions. Decimal positions: +,4,3,2,1,0,F and rounding switches. Back space and sign change keys. 12-digit Executive Business Desktop Display Calculator. Extra large adjustable LCD display with punctuation. Grand total, Memory, Square root and percentage functions. Punctuation, backspace and reverse key decimal positions: +, 4, 3, 2, 1, 0, F and rounding switch.